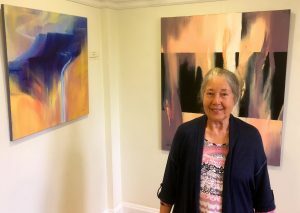 We are very pleased to be hosting an exhibition of alumna Mary Jose’s (Geography, 1957) paintings in College for the duration of Michaelmas Term. They have been selected from her ‘Desert Series’, which consists of 50 oils painted between 2011 and 2014. Each painting is inspired by a poem that was itself inspired by the desert.